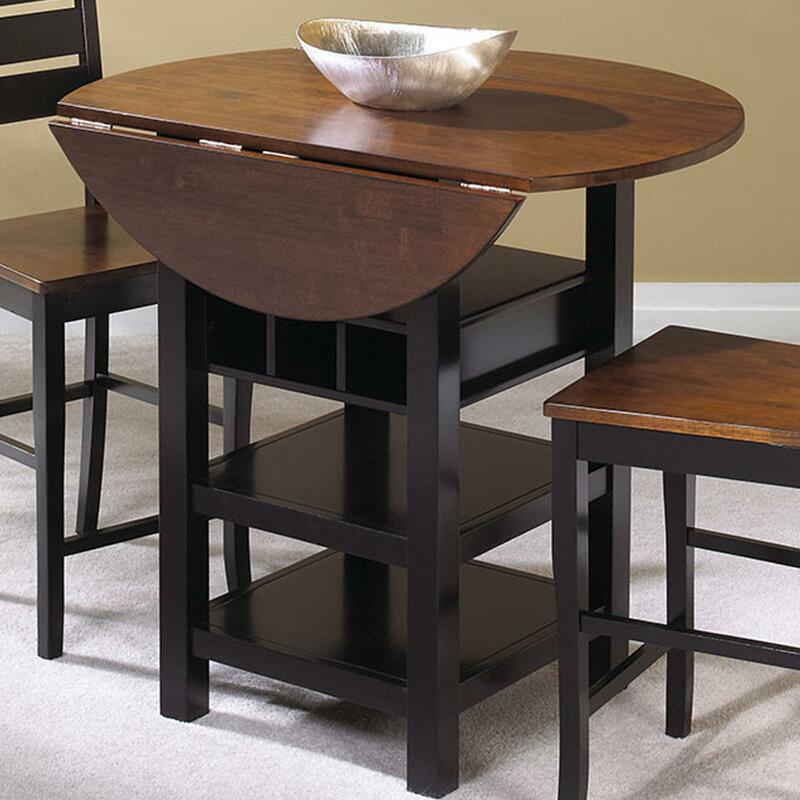 Counter height tables include many more options than the simple pub tables everyone’s familiar with. Whether you’re looking to add laid-back style or simple sophistication to your formal dining room, or you want to gain useful serving and storage area for daily living and entertaining, you’ll find a counter height table that fits in perfectly. Many of these versatile tables feature styling that lets them blend in beautifully in any room, not just the dining room, so they offer ingenious ways to make your space more useable for whatever purposes you have in mind. 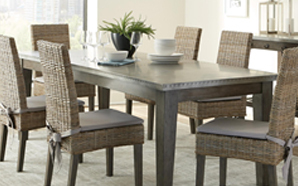 In many homes, the dinette space designed for daily dining is too small for a full-sized table. Because counter height tables come in smaller sizes than you’d typically find in a standard dining table, they offer a wide range of options to make small spaces work perfectly. 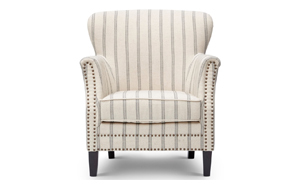 One option is a drop-leaf table, which has a smaller diameter top, and one of both sides fold down when not in use. This allows the table to hug a wall to allow more walking space around it, while making it easy to pull the table out when you need to use the entire top. Another smart solution in a smaller, open kitchen/dinette is to choose an oblong counter height table with built-in storage and use it as an island. This allows you to create new counter space for food prep or serving, and defines the space without blocking the view to the rest of your living space. 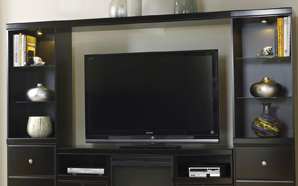 You gain seating and storage without the expense of installing a permanent island. This is also a smart approach for personalizing a rental home. 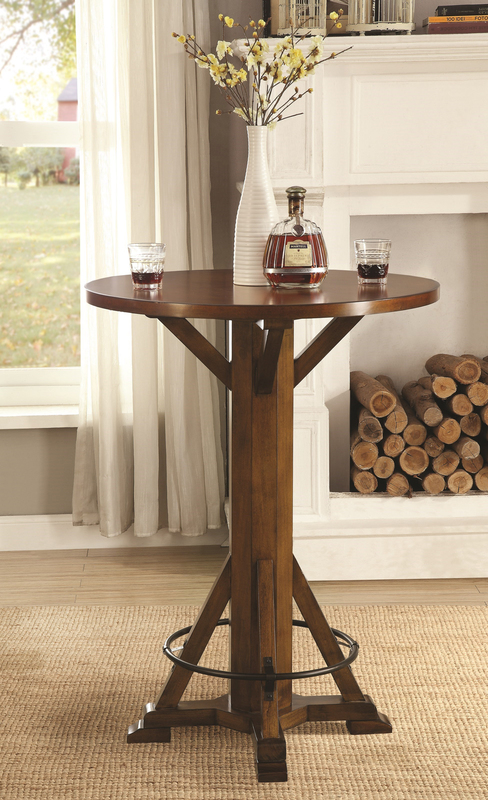 While people may be less familiar with other forms of counter height tables, the pub table is the first of its kind to gain widespread attention and popularity, and with good reason. Pub tables, or bar tables, make it more comfortable for people to gather, even when there isn’t room for everyone to have a chair. They stand tall enough that most people will notice them, even in a crowded room, so there’s less risk of food and drinks getting spilled, and they’re also better than standard-height tables at keeping small children and curious pets away from thing you don’t want them getting into! Because these tables are easy to move, you can shift your entertaining space as often as you like, to create the kind of atmosphere you want for every event. It might sound like an odd idea at first, but counter height tables can also make valuable additions in a living room or family room. If your kitchen was designed without a dinette or breakfast bar, you can create one with a counter height table. Choose an oblong table with a leaf for more flexible seating space on both sides if you have the space, or place the table against the back of a sofa to create one-sided seating that allows people to watch TV while eating, without risking spills on your upholstered furniture. In a formal dining room, you can create an intimate corner nook with a square counter-height table, or comfortable, stylish seating for eight with a larger table featuring removable leaves for times when you want more available space and less seating. 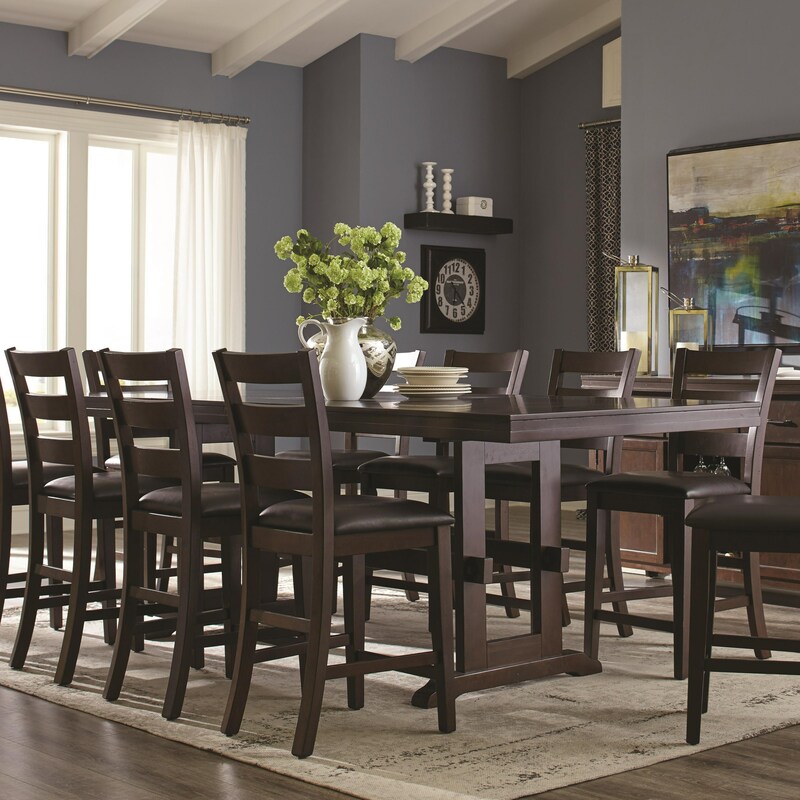 If your formal dining room is on the smaller side, you can still achieve an elegant look with a contemporary counter height table for four, or a rich walnut-finish set with a built-in Lazy Susan, a storage cabinet, and seating for six. If you’re looking for ways to update your home’s style and solve some issues of dining and entertaining space, counter-height tables offer a wealth of options and style choices. 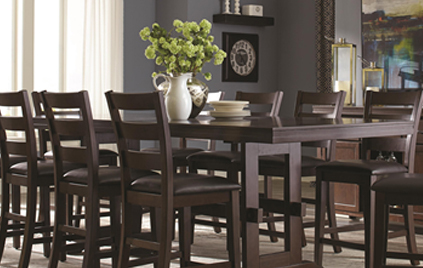 Visit your nearest Value City Furniture, NJ store, and we’ll work with you to find the table that fits your space, style and budget.